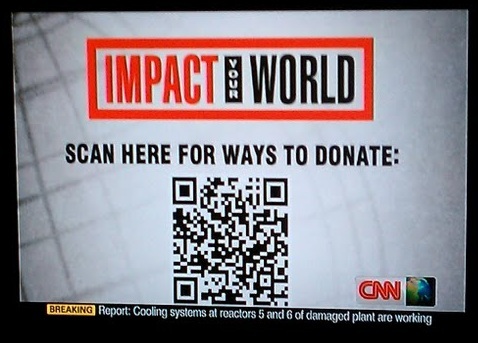 CNN began testing QR codes on air this weekend to direct people to a site where they can help Japanese earthquake and tsunami victims. The code was easy to scan, even without pausing the broadcast. It worked fine from across the room. Just launch a barcode scanner and it will decode the URL and give you the option to open it in the browser. If you have a scanner, you can scan it off the image above. If not, click to go to the Impact Your World mobile site. This is a great implementation of the often over-hyped QR-code technology. Print ads have occasionally featured QR codes which take you to an advertiser’s URL. In movie trailers. Scan it and it gets added to your movies to see list, possibly with a calendar entry dropped on the release date. Or an option to add to your Netflix queue for movies that are less interesting. In TV commercials and on billboards. Scan to go to the advertiser’s site. On CNN. Scan to get more information on a story. QR-codes have a number of advantages over other technologies. They are free to generate, don’t require any hardware beyond a camera, hold more data than a standard bar code, are easy to replicate, work across a distance and have a built-in call-to-action (scan me!). QR-codes can also hold structured data; scanning the QR code on Rakeshagrawal.com will load up my contact information. But it’s not the ultimate technology for every application. As much as people in the technology industry like to claim that one technology will take everything, that rarely happens. Artwork at MoMA scanned with Google Goggles. 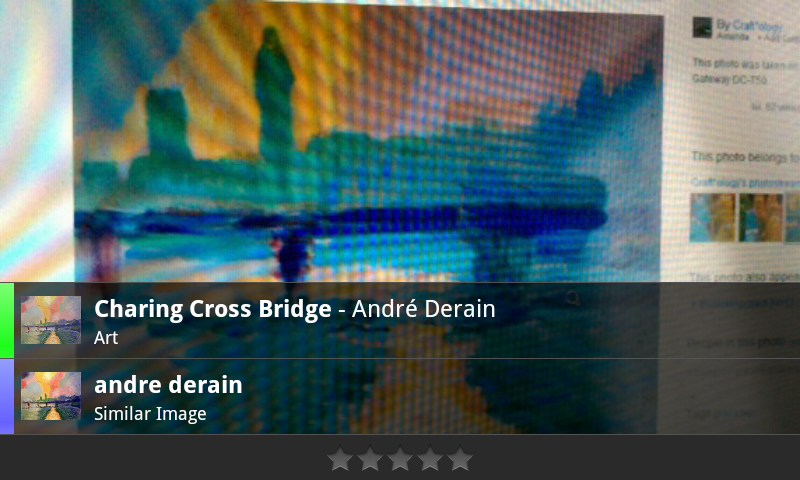 In this case, it was a scan of a picture of the painting on flickr. Here are some other applications where other technologies work just as well or better. Identifying artwork. Many paintings in the MoMA’s collection can be identified just by taking a picture of it with Google Goggles. Let’s face it, QR codes are ugly. They’re designed to be easily readable by machines, not to be pretty. I should point out that the wacky kids in Dubai are trying to turn them into architecture with a QR-code hotel. Still, it’s not my taste in architecture. Payments. Because they are easy to reproduce, QR codes (and bar codes in general) aren’t well suited for payment applications. They only work when you don’t really care about security. Scanning books or products. One discussion that came up recently was using QR codes in stores like Barnes & Noble to identify whether a book is available in nook format. That’s overkill — you can do this perfectly well with the bar code already printed on the book. Heck, you can take a picture of the cover and that’ll work. Print ads. URLs can be detected with simple OCR software. No need to clutter your creative with an ugly QR code. The key here is to use a simple font against a high contrast background and leave space around it. That’s a good practice anyway to ensure that human eyes can read it. Checking in to a business. WiFi and GPS positioning do a reasonably good job of this without requiring businesses to do any extra work. This could be improved, but it works OK. 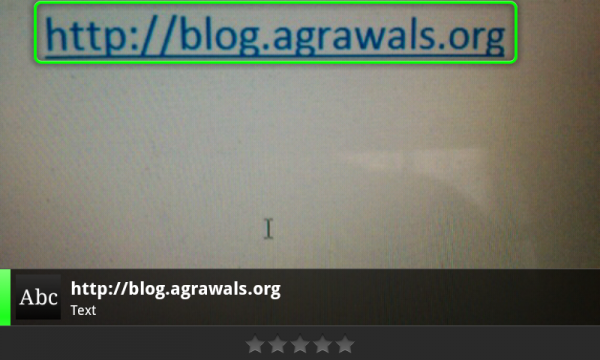 Plain text URLs work just fine in Google Goggles.